Before I start this review, there’s something you should know about me. The first is that I don’t spend money easily. Some would call me tight, but I prefer thrifty! I only commit to making a purchase when I’m sure it will perform the function I want it to. That goes for anything; clothes, stationery, things for the house, anything but the weekly food shop! Whatever it is, I research it to death, reading every online review I can find, comparing the good to the bad to narrow down my choice to ‘the one’. So when I bought the Sakura Pigma Micron for the first time I had high expectations, which I’m pleased to say this pen met admirably. 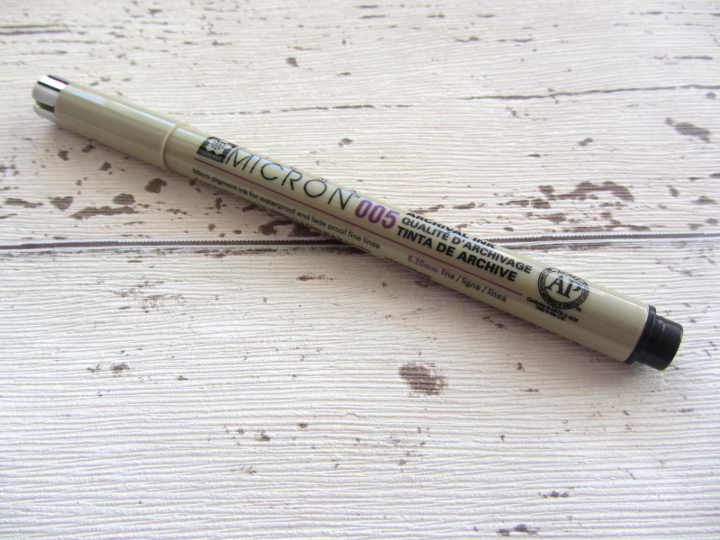 I’ve chosen to review the Sakura Pigma Micron size 005 (0.05 mm) as this is the pen I have had most experience with. To be honest, I don’t expect such a fine nib to last a long time, so the Sakura Pigma Micron 005 performs well from my point of view. I’m quite particular with my lines, and prefer them the very fine width that a new pen can achieve, so once they’ve worn down a little I relegate them to the pot I reserve for sketching. I find a Pigma Micron lasts me for one or two detailed drawings, but you may find you can continue using them for longer if you have a more sketchy style. I tend to use mine on watercolour paper, which has a lot more texture than, say, Bristol board, so they wear down more quickly. That said, I haven’t yet run out of ink (due to my relegating habit), so I’d say they’re excellent for how long they last. Sakura Pigma Micron pens come in a variety of colours, but black is my absolute favourite. According to Sakura’s own website, the archival ink is ‘permanent, fade resistant, chemically stable and pigment-based’ so it produces a deep, solid black line which is waterproof and will stand the test of time. 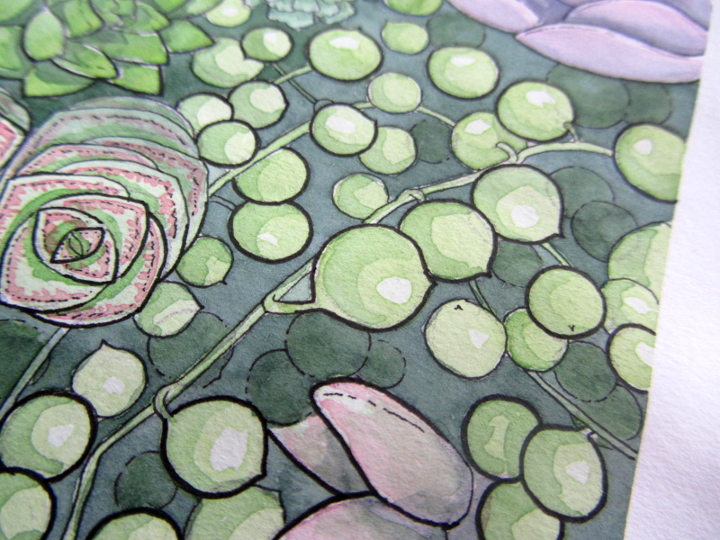 I use mine to outline sketches before painting with watercolour and I’ve never had a problem with the steadfastness. I really like the way the Pigma Micron feels to draw with, it’s smooth and the lines produced are solid and uniform. I haven’t found the ink to bleed at all and I’ve used them on a few different papers. 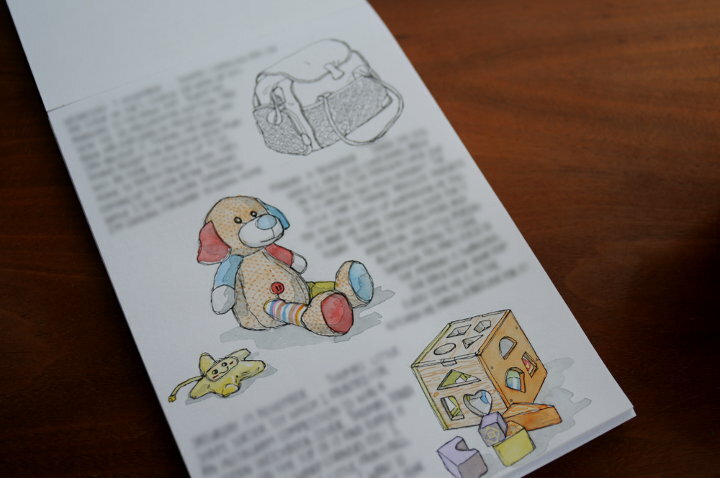 I’ve been working on a colouring book on Bristol board for quite some time now and I love the beautiful crisp finish this pen achieves. It is very versatile as I find I can use it for several different styles of drawing, from quick, sketchy lines to detailed, accurate pieces. The lines dry really quickly, almost immediately even on smoother, less porous drawing surfaces. This is a real bonus as I don’t have much patience when it comes to waiting for ink to dry before I start painting! I primarily use the Pigma Micron as a drawing pen, but I’ve also used it for writing in my art journal. 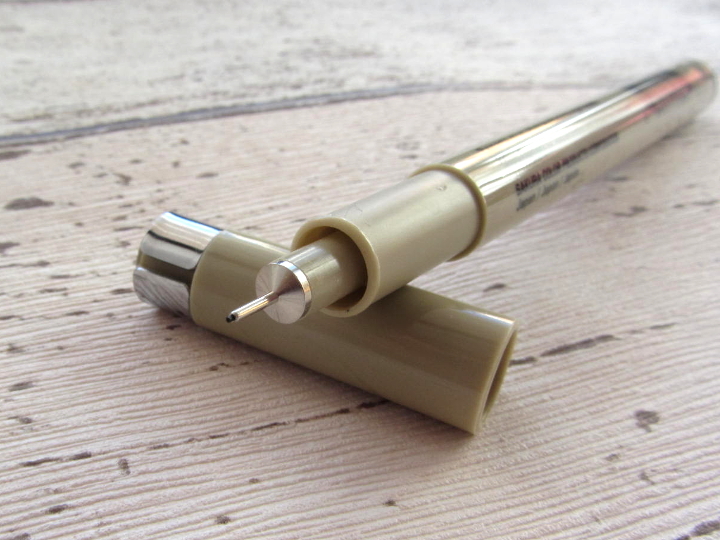 It’s easy to write with and the application of the ink is smooth, not scratchy or blotchy. I do find myself adjusting the pressure of my writing so as not to put too much strain on the tip, so if you like to write with quite a bit of pressure, this is probably not the pen for you. I still prefer to write with a ballpoint pen, but that’s just my personal preference! I’m not too fussed about what a pen looks like as long as it does what I want it to. Some would say that the tan colour isn’t very attractive, but it doesn’t bother me. I like the feel of it in my hand, the lid is nice and secure and they’re well labelled with the size, so it’s harder to pick up the wrong one by accident. It is plastic, but again, that’s no problem, besides the environmental impact. All in all, I would definitely recommend this pen. I keep buying them and I haven’t used another brand since I started using them, so that’s a testament to their quality. I’m sharing this post on the following blogs: Handmade Harbour and Paint Party Friday! This is so good to know, thanks. I follow a few people who handletter on instagram and this pen keeps popping up in their photos so I was wondering if it was worth trying. I definitely will now. Great to know. Love the work you do with the pen. Wonderful review from a frugal practical, smart shopper! 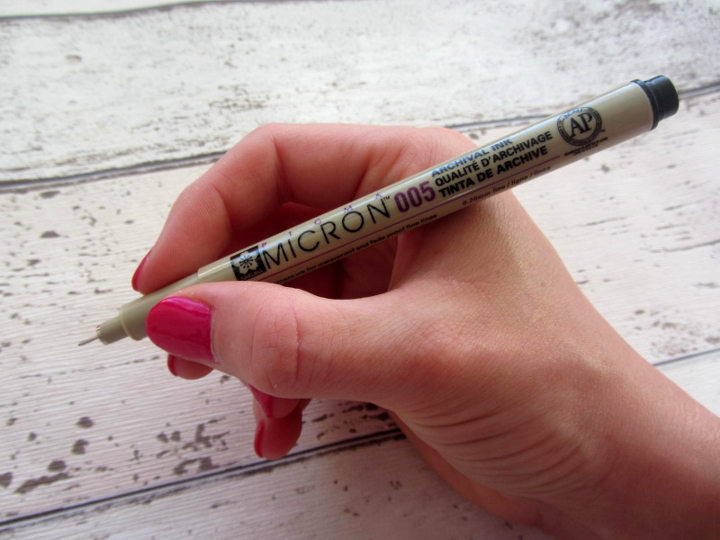 I know many artists love their micron pens…many sketch in pencil first then line over it in macrons. Beautiful artwork too! We are smart shoppers in this house too.. we even use coupons for food at times and watch all the sales. We research everything too! This way it affords you those lovely guilty pleasure purchases!! My daughter loves her fluvog boots!! Great post thanks for sharing! Some may say tight, I still say SMART!! I’ve been using Micron pens for years and, like you, I appreciate their durability, highly waterproofed ink, and assortment of sizes. Although I’ve tried other pens, I seem to always go back to Microns. I also use fountain pens with waterproof inks like Nooders and Platinum Carbon black. These inks don’t dry as quickly as Microns and the fountain pen nibs aren’t as fine as a .005 Micron, but then again they have other properties which make them appealing. If you want to travel lightly, then Microns are a great option. If there is one suggestion that I could make to the good people at Sakura, it would be to make Microns in various shades of grey ink. Yes, grey would be good! I’ve never tried waterproof ink in fountain pens, but quite like the effect that can be achieved when adding water to non-waterproof ink for shading etc. I like how fast the Micron ink dries too, no risk of smudging! Thanks for your comment!